Join me this Monday, August 21st via Facebook Live on my Creating Family Archives group page. If you're not already a member, come join the fun! Due to a business trip, I'll be filming at a new time and location: 9 pm EST from my mother's house! All you need to do to join me is click this link and watch the video on Facebook at 9 pm EST. (Don't live in the Eastern time zone? Convert your time zone here). 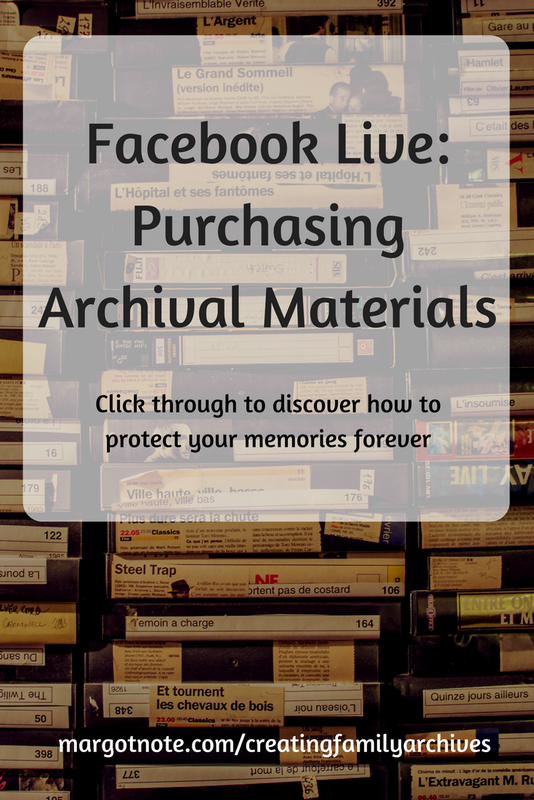 In this session, we'll be discussing what to look for to rehouse your precious family treasures. The preservation of your collections is significantly advanced with the help of stable enclosures. Once you have your selection of acid-free, lignin-free, pH neutral boxes, folders, tissues, and more, you can ensure the safest storage possible for your most valued items. Are Your Archives at Risk?